During the first week of April, every time I turned a corner in northern France I was met with the familiar site of the Canadian flag. In the nearby towns of Givenchy, Neuville-Saint-Vaast, and Vimy, the red maple leaf was prominently displayed along roads, in local cafes, and in the windows of the homes we passed. 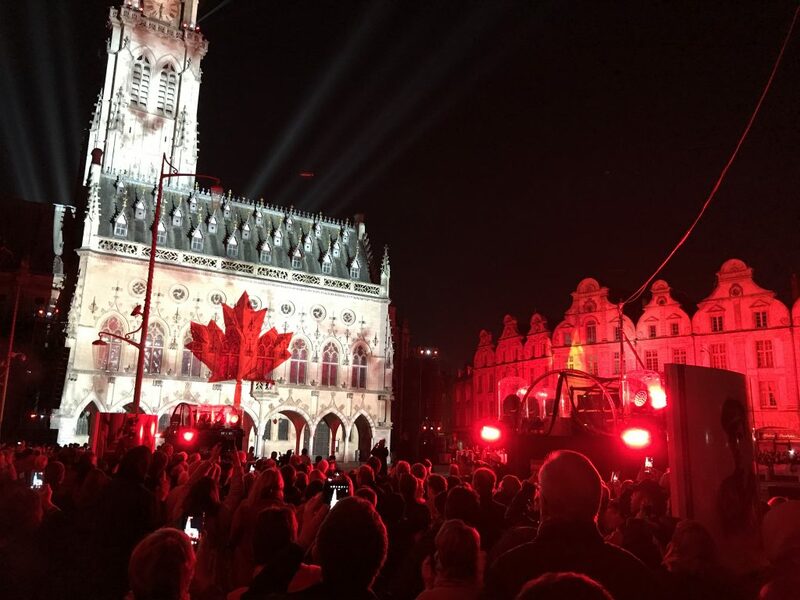 The Place des Héros in the city of Arras served as the backdrop to a spectacular sound and light show honouring the wartime service of Canadian and French soldiers during the First World War. One hundred years ago, two nations bonded over sacrifice and bloodshed, and today respect and friendship remain. The Place des Héros on 7 April 2017. Access to the Canadian National Vimy Memorial was restricted beginning on 1 April. During that busy week, the landscape and monument were staged for the highly anticipated ceremony. 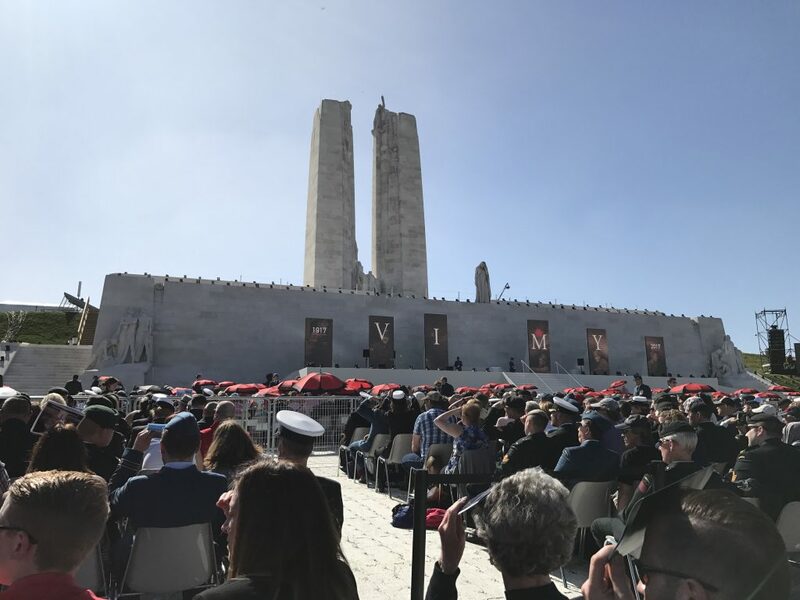 At 9:00 am on the morning of 9 April, we parked our cars outside the town of Vimy in one of the five designated car parks (ours was located three kilometres from the memorial), and queued for security checks and transportation to the memorial site. The Ottawa Children’s Choir stood behind us, while Lieutenant-General Roméo Dallaire waited patiently ahead. The atmosphere was a mixture of excitement and anticipation. Much like the soldiers who took these grounds one hundred years ago, the majority of the crowd was under the age of twenty-five. 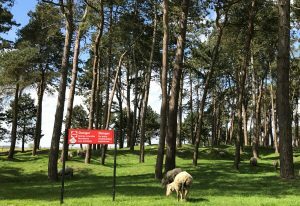 Signs warning of undetonated explosives are common throughout the Canadian National Vimy Memorial site. At 9:40 am the line started to shuffle forward as security began screening the front of the queue. Our official e-tickets issued by Veterans Affairs Canada were scanned, and our passports examined. Items such as large flags and banners, reserve camera batteries, and pop cans were banned from the site. Shortly after clearing security we boarded a shuttle bus for the ten minute drive to the memorial site. From there, we were instructed to follow the crowds on foot past the scars and shell craters of the battle still preserved in the landscape. Some people paused to capture photos of the red warning signs of undetonated explosives not far from our footpath. The Vimy Event Guide sternly warned us not to touch any wartime debris we might come across while walking these grounds. As we approached a clearing we saw the monument. Walter Allward’s magnificent tribute to Canada’s fallen has stood guard over Hill 145 since its unveiling by King Edward VIII in July 1936. Veterans Affairs Canada transformed Allward’s masterpiece monument into the focal point of the commemorative event. The two towering pylons rising high against a flawless blue sky set the scene for the solemn occasion for which we had gathered. We continued our walk on the pathway leading to the front of the monument. Over the next five hours, a steady flow of 25,000 people followed. By 11:00 am we had found our seats. The weather was superb but the sun was hot. Facing a five hour wait before the ceremony was scheduled to begin, many people searched for protection from the sun. Umbrellas opened to offer some relief from the blazing sun as spectators shared suntan lotion with one another. Activity tents along the perimeter of the site offered an excuse to escape the sunlight. A chalk wall of remembrance was crowded with high school students writing messages of thanks to our armed forces. Much like the 1936 unveiling of the Vimy memorial, the French post office was on site selling commemorative stamps, and collecting the postcards that we were mailing back home to Canada. Several water stations kept us hydrated, and long lines of patient attendees pointed to the nearest water closet. The crowds in attendance were estimated to be as many as 25,000. As we scribbled messages onto postcards and collected commemorative pins, the human cost of the battle was never far from our thoughts. Throughout the pre-ceremony, the 3,598 names of the fallen soldiers at Vimy Ridge were read aloud. “Private John Richard Aaron; Lieutenant Edwin Austin Abbey; Private David Abbot …” As we carried on in the afternoon, the names continued. 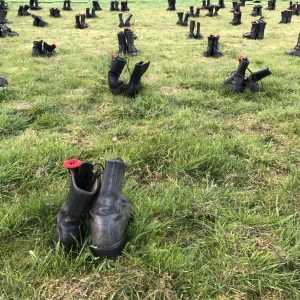 “Private Vernon Lewis Borden; Private Ernest Henry Borrow; Major Samuel James Bothwell …” Boots of the fallen were placed on site by French and Canadian children, creating a powerful representation of the lives lost during the four day battle. “Private John William Carnell; Private Arthur Carr; Private Edwin Fraser Carr …” The reading of the alphabetical list of names continued for hours. This chalkboard was a place for people to write messages and sign their names. Just after 4:00 pm, the sound of the twenty-one gun salute marked the arrival of the dignitaries. Polite applause greeted Their Royal Highnesses The Prince of Wales, The Duke of Cambridge, and Prince Harry. His Excellency the Right Honourable David Johnston, Prime Minister Justin Trudeau, and President François Hollande followed closely behind. The crowd fell silent as the ceremony began. The commemoration ceremony was a combination of theatre, musical performances, speeches by dignitaries, and traditional moments of remembrance. Five replica First World War biplanes flown past the monument were met with excitement from the crowds below. Their cheers turned to respectful applause as The Duke of Cambridge and Prince Harry ascended the stairs to place the final two pairs of boots of the fallen in front of the empty tomb. Monologue performances by acclaimed Canadian actors introduced the crowd to Canadian soldiers who served on these battlefields, while the pianist and singer Loreena McKennitt performed a haunting rendition of Dante’s Prayer. Event programs, postcards, stamps, tattoos, and commemorative pins were available. 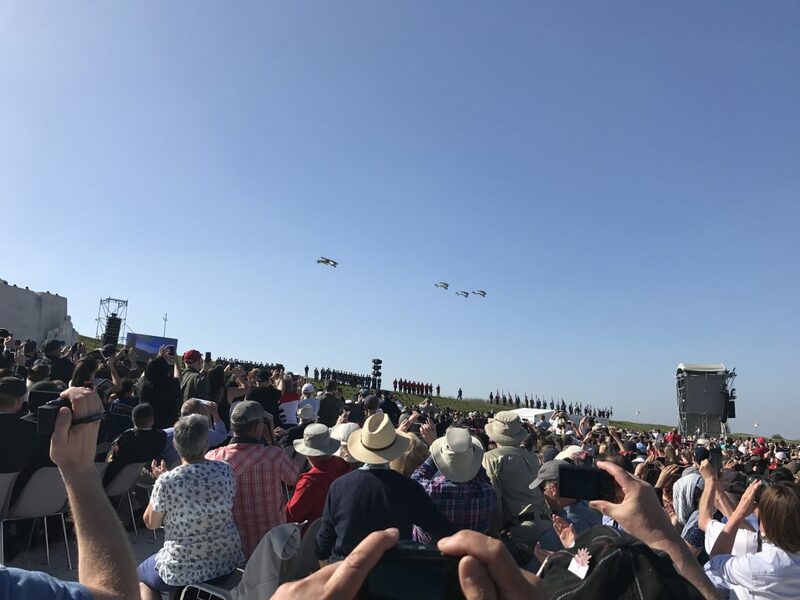 Addresses made by the dignitaries spoke of Canada’s military history, the successful capture of Vimy Ridge, and connecting the bravery of Canada’s soldiers one hundred years ago to those who serve in our armed forces today. “Canadians displayed a strength of character and commitment to one another that is still evident today,” proclaimed The Prince of Wales, “they did not waver. This was Canada at its best.” Others promised that the unimaginable loss of life has not been forgotten. “One hundred years later, we must say this together, and we must believe it: never again,” pledged Prime Minister Trudeau. The sounding of the Last Post was played on Private George William Shaw’s First World War bugle. The crisp sound echoed across the silenced ridge, and the stillness and respect of the crowd was quite moving. Poppies were worn by practically everyone in the crowd, many of whom carried photographs of family members who served on these battlegrounds. Throughout it all, the statue of Canada Bereft’s bowed head stood in solemn tribute to a nation united in grief one hundred years ago. The ceremony concluded just after 6:00 pm. As large groups hurried to board the shuttle buses, we waited patiently for the memorial site to clear. Having been part of a privileged few to witness such an historic event, we were in no rush to leave. We chose to take our time, reflecting upon the importance of the event that we had just witnessed. By 7:00 pm the sun set behind the memorial, and the heat of the day had turned to a cool breeze. Climbing the steps of the Vimy Memorial, we made our way to the back of the monument, pausing to read some of the 11,285 names inscribed on the walls. 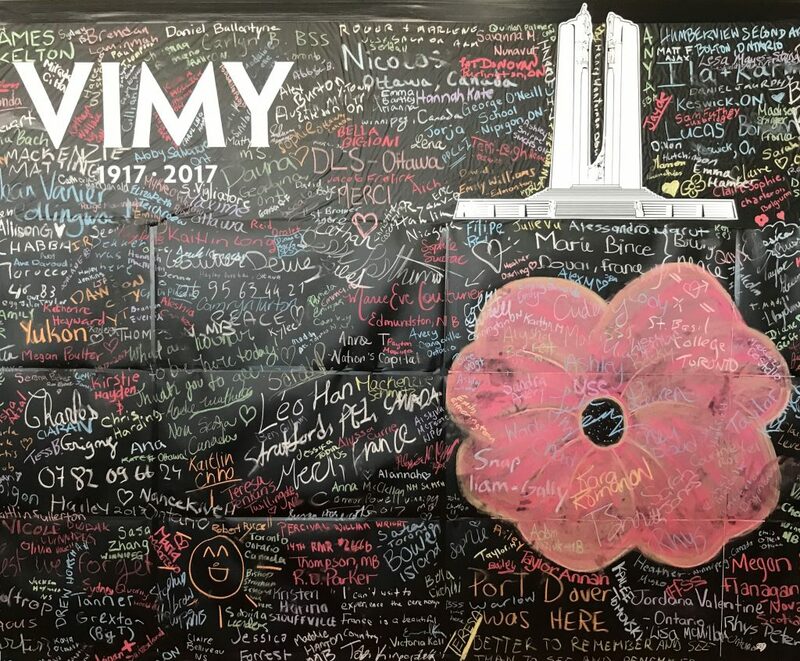 On 9 April 2017, tens of thousands of Canadians at Vimy Ridge were both witnesses and participants as they commemorated a significant event in our nation’s collective memory. 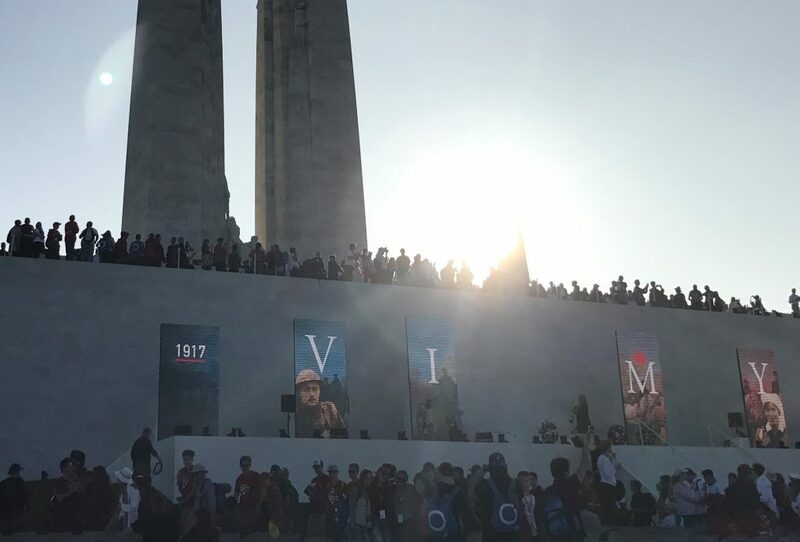 Live broadcasts and #Vimy100 posts on social media connected Canadians at home to the ceremony in France. The concluding words of our Prime Minister reinforced the importance of our continued efforts of remembering the sacrifices of those who came before us. “They were Canadians,” said Prime Minister Trudeau, “and they were valiant beyond measure. Honour them.” For those of us who were gathered in France, and watching at home, it was a privilege to honour and remember them, one hundred years later. Once the ceremony concluded, hundreds of people crowded onto the monument. Katrina Pasierbek is a PhD student at Wilfrid Laurier University studying First World War commemoration and tourism across the Western Front. She was in France working with CANADIGM to digitally record Canadian First World War cave carvings. Her research is featured in CANADIGM’s travelling exhibit ‘Souterrain Impressions,’ currently on display in the Vimy Education Centre at the Canadian National Vimy Memorial until November 2017. Fly past of First World War replica biplanes. 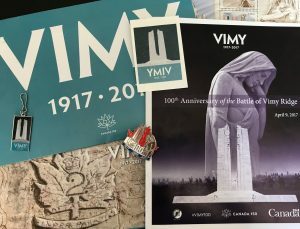 Pre-registration to attend the ceremony was required by 17 February 2017; “Information and Event Guide,” Veterans Affairs Canada, http://www.veterans.gc.ca/eng/remembrance/history/first-world-war/vimy-ridge/100-anniversary/vimy-event-guide/general-information#reg (accessed 20 April 2017; last modified 24 March 2017). “Special Vimy Stamps Sold,” The Leader-Post (Regina, Saskatchewan), 28 July 1936, 9. “Find War Dead,” Commonwealth War Graves Commission, http://www.cwgc.org/find-war-dead.aspx?cpage=1&sort=name&order=asc (accessed 20 April 2017). 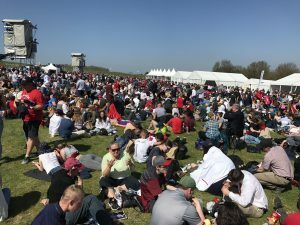 Matthew Trevithick, “1,000 attend London gala dinner commemorating Vimy Ridge centennial,” Global News, 2 April 2017, http://globalnews.ca/news/3351613/1000-attend-london-gala-dinner-commemorating-vimy-ridge-centennial/ (accessed 20 April 2017; last modified 3 April 2017).